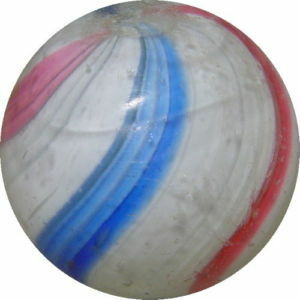 "Peppermint" Swirls always have a white opaque base which is covered with (only) blue and red bands. 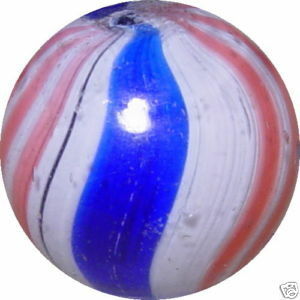 These marbles are usually quite small (less than 1 inch), bigger examples are very rare. 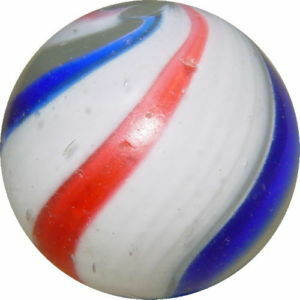 Personally I don't like this type of marble very much but they are popular among US-collecors for patriotic reasons (US-Flag colors). Sogenannte Peppermint-Swirls bestehen immer aus einer weissen nicht transparenten Murmel die mit roten und blauen Bändern verziert ist. Die Murmeln sind meist klein. 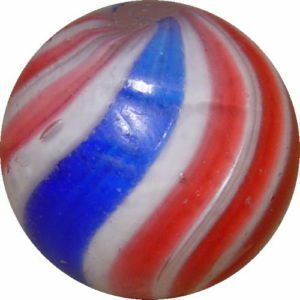 Ich persönlich kann den Peppermint-Swirls nicht viel abgewinnen, aber bei vielen Sammlern in den USA sind sie aus patriotischen Gründen (sie haben die gleichen Farben wie die US-Flagge) ziemlich beliebt. 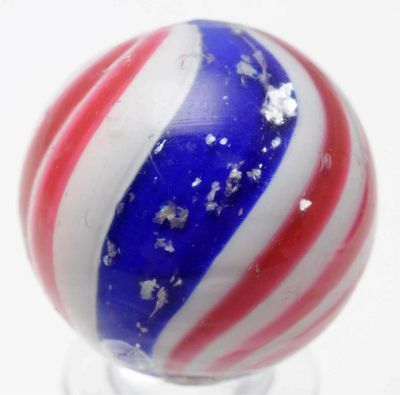 Extremely rare are "Peppermint" Swirls with Mica added (always in the blue stripes).